RSVP at our Facebook Event page. 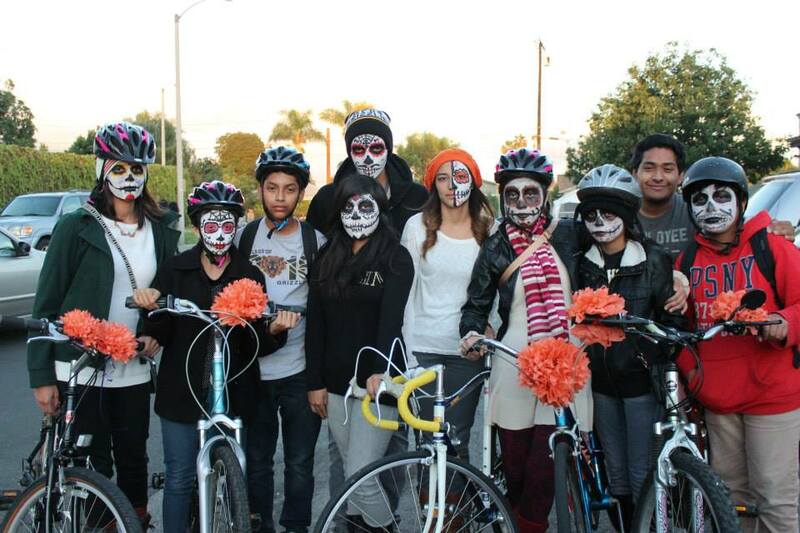 Join us on November 1 in Santa Ana for our Day of the Dead bike ride! Santa Ana has made huge improvements in making streets safer for bicyclists, but many still have lost their lives riding on the city’s streets. This ride is aimed at commemorating those that have lost their lives in fatal bicycle collisions in the city and surrounding areas. This is a family friendly ride; all ages are welcome. We will be offering face painting, snacks and other goodies. Roll out time: 3 p.m.
Day of the Dead is traditionally a Mexican holiday and acknowledged around the world in other cultures. The holiday focuses on gatherings of family and friends to remember their loved ones who have died. Typically, folks gather goods and sweets and hold a little memorial for those they have lost and leave it at their gravesite. People also paint their faces in unique bright colors and designs.